Batsman Ian Bell will not see being dropped from England's Test squad for the tour of South Africa as the end of his international career, says pace bowler Stuart Broad. Five-time Ashes winner Bell, 33, who has played 118 Tests, has been dropped from the four-match series, which starts in December. Bell has not scored a century in 23 Test innings. Former England batsman Kevin Pietersen labelled the decision "pathetic". England wicketkeeper Jos Buttler called it a "tough situation" for Bell, while former head coach Peter Moores told BBC Radio 5 live that the player has "got some cricket left in him". Bell has already said he is "absolutely gutted" to miss out, but "determined" to win his place back. Nottinghamshire pace bowler Broad, who is in the squad, added that Bell was a "world class" player who would bounce back. "He will be very determined to work hard and get back in," said the 29-year-old. "We know in cricket that opportunities do arise and, although he is not in this Test tour to South Africa, he won't see that as the end of his career. 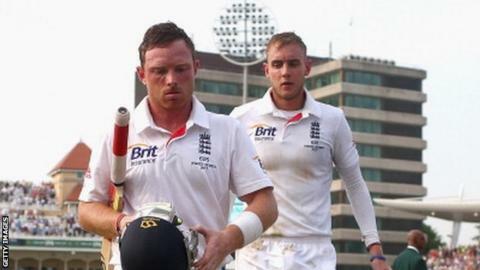 "He will be working hard after a bit of a break to improve, put runs on the board and get back in this England side. "You can be one injury away from getting your spot back and he will work on his game. I am sure he won't rest. He will be very focused." Pietersen, who last played for England in January 2014, said Bell's omission was "ridiculous". "You have to take him for his experience," added the 35-year-old on a video hosted by breathesport.com. "It is pathetic. I think he has been hard done by here." Moores, sacked by England in May, said Bell will understand the decision to drop him. "Ian's going to be very disappointed but he also knows the nature of sport means if you're not performing to the top level you're exposed to being left out," he said. "It'll have been a very tight decision but he also understands he's not put the runs on the board and that's given the selectors the opportunity to look at someone else." Buttler, 25, who lost his place as Test keeper to Jonny Bairstow in the final match of the recent Pakistan series but remains in the one-day side, told BBC Sport: "He is obviously determined to win his place back which shows great professionalism."